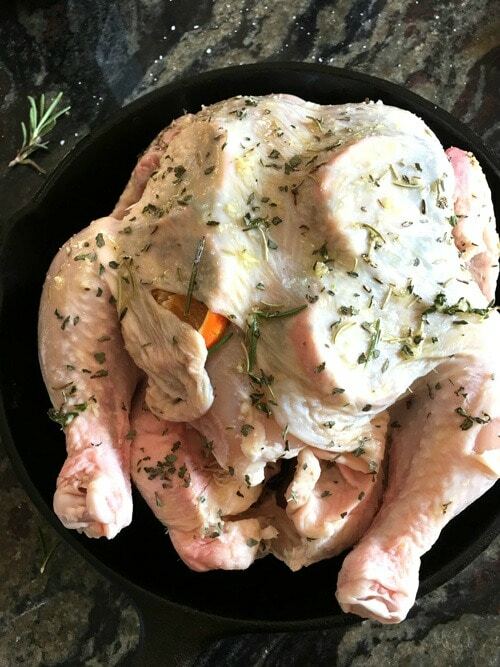 If you love roasted chicken, this roasted herb chicken is an easy dinner recipe you will want to make again and again! This oven roasted chicken recipe is full of all of the good stuff, garlic, fresh herbs, and sliced oranges. You will love how moist and flavorful this roasted chicken is! I am so excited to talk to you about wine today! Do you ever find it difficult to pair wines with dishes you cook? I used to feel so out of my depth about wine pairing. Mr. Fearless Dining and I have been going to more wine tastings lately and educating ourselves on flavor profiles of wine. I think you are going to be very happy with these wines from CK Mondavi. They are priced at a level that anyone can enjoy them. High-quality wine at a reasonable cost = a win-win for everyone! What is special is that these wines taste expensive…you can’t say that about many bottles of wine under $10 a bottle! Mr. Fearless Dining and I were completely surprised by these wines. Their 2015 Cabernet won a silver medal at the 2017 Critics Challenge and the silver medal at the 2017 International Women’s Wine Competition. Their Chardonnay won a bronze medal at the Tastings 2016 World Wine Championships, and their 2014 Merlot won a silver medal in the 2017 Critics Challenge. I love when I find good wines that pair beautifully with a recipe. 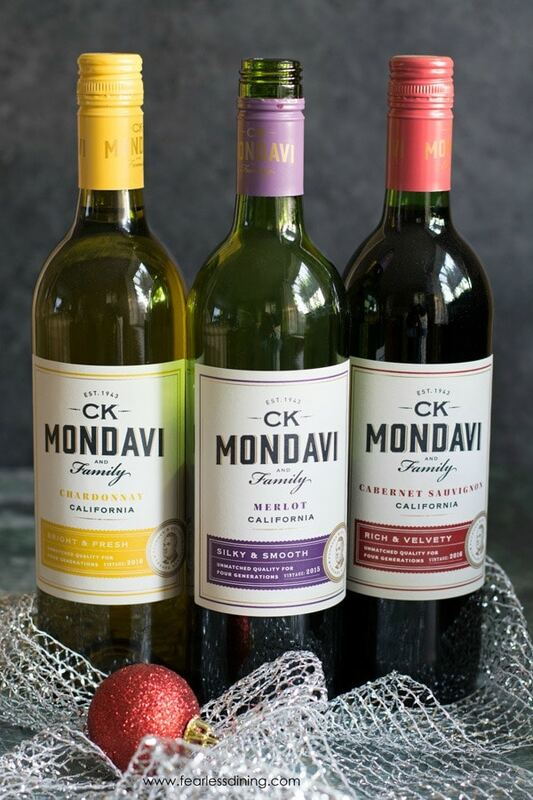 I tried CK Mondavi’s Chardonnay, Merlot, and Cabernet. Each has a distinct flavor profile! We paired the CK Mondavi Merlot with this flavorful roasted chicken dinner recipe. The hint of oak and cherry tastes delicious with the fresh herbs and citrus. 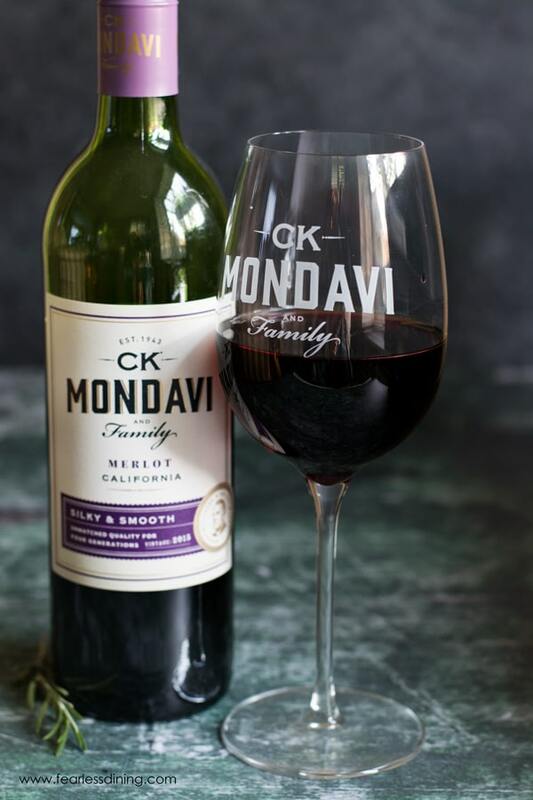 CK Mondavi’s Merlot is a medium-bodied wine, which allows it to pair with either poultry or red meat. If you love white wine, CK Mondavi’s Chardonnay would also work beautifully with this roasted herb chicken. 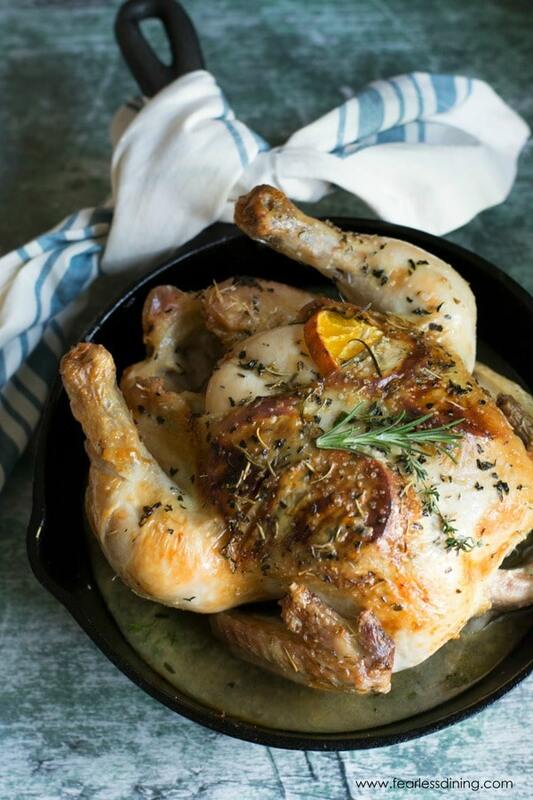 The secret to this roasted chicken is to stuff the fresh herbs, garlic, and orange under the skin. This allows the flavors to seep into the meat while roasting in the oven. What are the best herbs for chicken? Are you ready to make this whole roasted chicken recipe? I used my cast iron skillet to make this recipe. Feel free to make it in a roasting pan, or even a casserole dish. Chop up the fresh herbs and add them to a small bowl, add the melted butter, minced garlic, salt, and pepper and mix well. Take the raw chicken and make small cuts under the breast skin and legs. Take some of the herbed butter and rub all under the skin. This will allow the flavors to cook deeply into the meat. Rub the extra on the outside of the chicken. Next, slice a mandarin orange or tangerine. Add these orange slices under the skin as well. Bake and serve hot when the internal temperature is 165 F degrees. 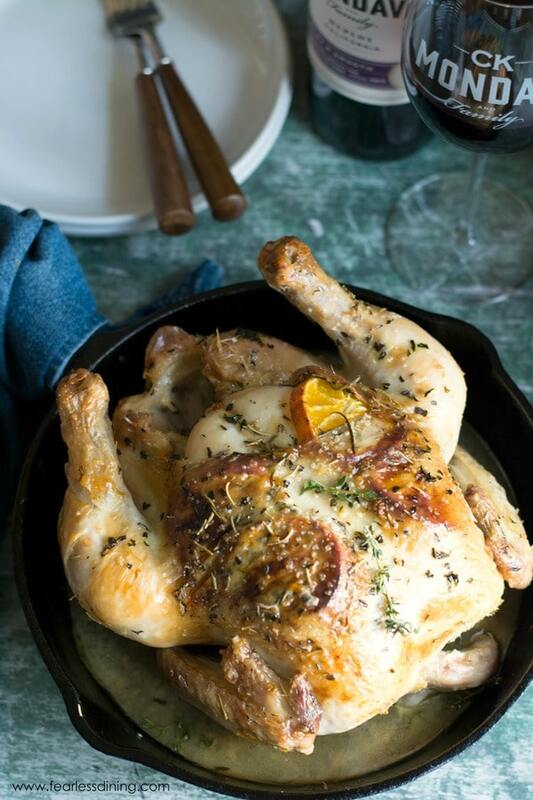 An easy roasted herb chicken with tangerine slices. Preheat the oven to 375 F degrees. 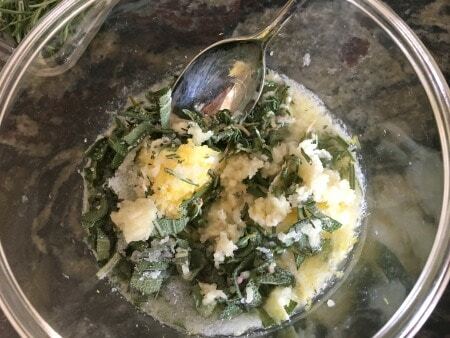 Add chopped herbs, melted butter (or olive oil), minced garlic, salt and pepper in a bowl. Mix well. Stuff some herb mixture in both and rub along under the skin. Rub the extra all over the outside of the chicken. Slice the tangerine and add slices under the skin. Bake for one hour, or until the meat registers 165 F degrees with a meat thermometer. You sure did pick the perfect wine to accompany this wonderful dish! This is an absolutely beautiful dish and one I would be happy to sit down to with a glass of CK Mondavi Wine! Thank you so much Shelby…I love their wines! Oh, yum! 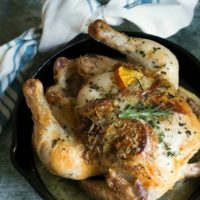 This is my kind of roast, and I love that you used orange slices for flavor – I will have to make my next roast chicken the same way! Thank you so much Nichole. Have a wonderful holiday! Oh my goodness, I bet the tangerine imparts such a wonderful citrus flavor! And I’m totally one of those people who picks wine because of the label – and I really like that one! It’s so clean, bold, and intriguing. Not the normal script type of label. I love finding that perfect wine pairing with a beautiful dinner! great photos. This looks easy and beautiful! Loving all the herbs and wine parings, all about the wine pairings! I haven’t tried these ones before, I’ll have to check them out although with our lately wine shipments we are all full capasity (and lacking storage space for the magnums they sent in our club orders) but in a couple weeks I’ll have room so these are on my list. I hear you…lucky you to get magnums with your wine shipments! Modavi was the first winery I ever visited in Napa! I bet the cab sav is delicious. I haven’t tried this line of wines yet, but will need to seek them out. I love the combination of flavors! Definitely adding this to my to-make list. There is so much great information in this post. I am always trying to think of which herbs to use and which wine to serve. This citrus and herb combination sounds delicious. Mandarins are a nice wintery citrus choice. When I look at a recipe for a whole chicken, I am also thinking about the leftovers. With this combination of herbs and the mandarins, I have already come up with the dishes to serve the next day. All of this is assuming that there even are any leftovers! This chicken sounds amazing! This is so simple and looks so delightful! I love cooking a whole chicken– meals for days! That manderin sauce sounds just delicious. yes, I’d sip that CK Mondavi Merlot wine right along side. I love a good dinner and a Robert Mondavi wine better if it is a merlot. You chicken recipe looks amazing and yoru photography is stunning, cheers! That chicken looks like it’s absolutely BURSTING with flavour! I’m going to make this for Sunday lunch. Thanks so much for sharing! Thank you Chris…my kids are already begging me to make it again! Despite being French, I know nothing about wine pairing lol but these wines sound fantastic. And look at this roasted chicken, so perfect! Love the addition of tangerine/orange, will try that next time. LOL, wine pairing is hard Marie. I go with what tastes good as my simple rule for wine tasting.